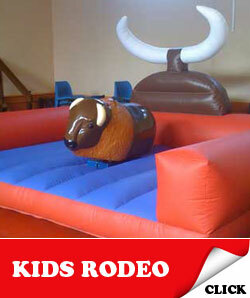 The rodeo bull is fantastic fun for adults and kids. 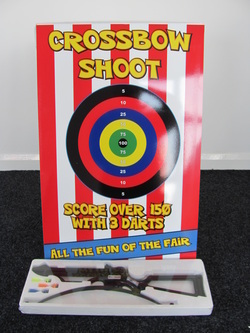 Its also great fun for spectators. The bull bucks and spins gradually getting faster. 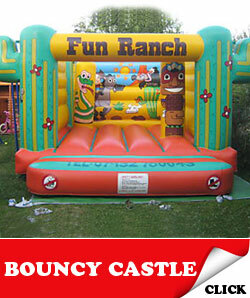 You need to grip tightly on the rope until you can take no more and are thrown off – onto the soft inflatable base! 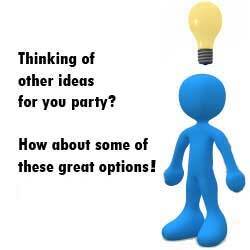 COMBINE MULTIPLE OPTIONS FOR FANTASTIC DISCOUNTED PRICES!!! 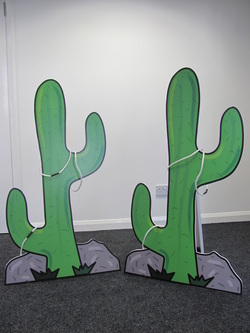 Ring the Bull, Cactus Hoops, Crossbow Shoot and Milke the Cow are all available with Rodeo Bull hire. 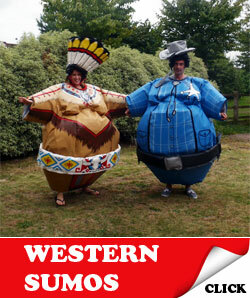 Why not add them to your rodeo package, giving your guests other party games to play. 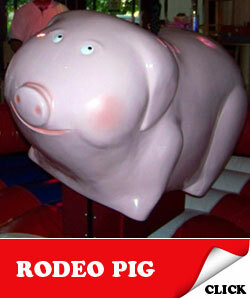 How about the rodeo pig instead of the rodeo bull!? Dont fancy the pig either? Well contact us as we also have access to a sheep! 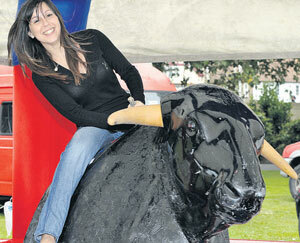 The rodeo bull ride is also known as a bucking bronco or mechanical bull. 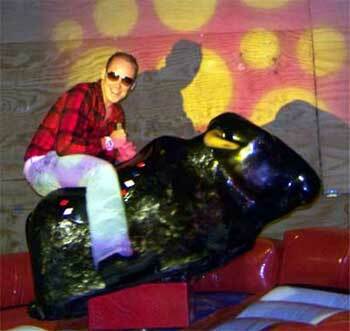 The idea is to hang on for as long as you can whilst the bull is spun and bucked around. Not only is this great fun for the rider but its great for spectators to watch. 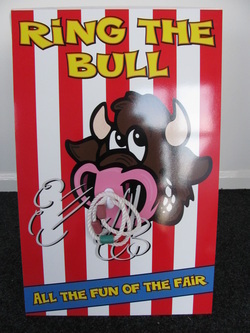 We use the latest rodeo bull ride with a large competition timer, so that everyone can see their ride times. 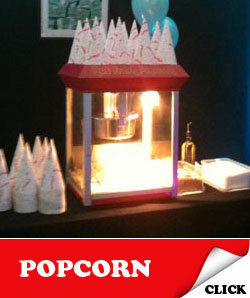 The operator has complete control over the speed of movement and will remain there for the duration of your event. 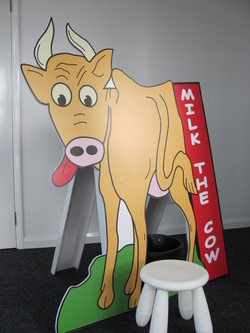 The ride is suitable for children, but we would ask that the rider can actually get on and off the bull without any help. Available as an optional extra we can also bring along a PA system which you can hook up your own MP3 player to, this also includes a microphone so that the operator can announce ride times, give advice and run competitions. - contact us to see if we can help. 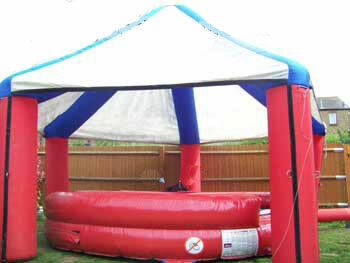 Inflatable marquee can be used in light rain, in event of heavy rain/high winds see our terms and conditions. We are based in Kent on the border of South East London, so regularly travel to events in the capital and home counties as well as Essex and Surrey. If you are outside this area please call to discuss further. We can cover towns such as Ashford, Bexleyheath, Bromley, Broadstairs, bluewater, Charlton, Catford, Croydon, Canterbury, Crayford, Croydon, Canterbury, Chatham, Chelsea, Dartford, Deal, Dover, Eltham, Faversham, Folkestone, Greenhithe, Gillingham, Gravesend, Greater London, Herne Bay, Hythe, Lakeside, London, Lewisham, Longfield, M25, Medway, Maidstone, Mayfair, Norwood, Northfleet, Park Lane, Rainham, Ramsgate, Rochester, Sandwich, Sidcup, Soho, Sevenoaks, Surrey, Sheerness, Sittingbourne, Swanley, Southend, Sidcup, Strood, Sevenoaks, Swanley, Tunbridgewells, Tonbridge,Tenterden, Tonbridge, West Malling, Westerham, west kingsdown ,Westminster, Westgate-on-Sea, Welling,Whitstable, W1. 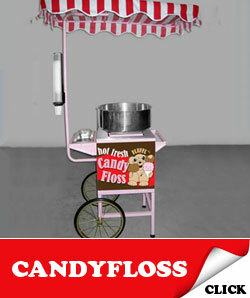 If you are interested in any of our services, please contact us for more details.